This coming-of-age story is set in the 1980s and told through the eyes of Shelley, almost 15, two years after she and her father have become impotent with grief when death devastates their family. Shelley decides to try and start a new chapter in her life, moves schools and has some promise of a friendship with her new friend Tara, although it’s a complex relationship, as both girls find it hard to open up. Shelley’s father has become a shell of the man he used to be and sits in front of the telly for hours when he’s not at work. The two of them don’t talk anymore and seem stuck, never discussing the life changing, catastrophic event. Any easy dialogue between them revolves around footy. The only thing that interests Shelley is AFL and her beloved Glenthorn footy team. Footy makes her feel alive, and Tara introduces her to the world of the official cheer squad. Shelley becomes obsessed with the team and one of the star footy players whom she considers a friend. But is he? Shelley engages in risky behaviour to get the player’s attention and believes her life is finally great. Then there’s Josh who she’s know since she was little. Shelley can see things have changed between the two of them, but is too preoccupied to let Josh in. Shelley’s hidden grief and inner conflict, as well as bad choices, slowly unfold until they reach a crisis point. Strong exposition and dialogue ensure an emotional response by the reader. Hayes’ writing, particularly in the last few chapters is convincing and evocative. Overall, a great first novel with extensive AFL knowledge as the author is a keen fan herself. She has captured the culture and essence of die-hard footy supporters really well, especially finals fever and the highs and lows fans experience. Teenage girls who follow football will enjoy this book. The voice is original and convincing and the characters are believable – especially the footy tragics in the cheer squad. Don’t let football (almost a main character itself) deter you from reading this book. I’m not into footy and enjoyed the story and characters. 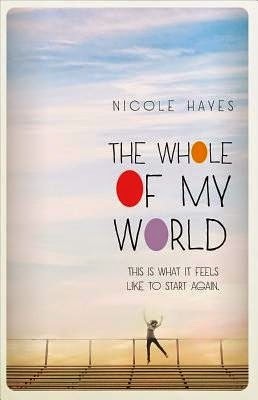 The Whole of my World is Nicole Hayes’ first novel for teens, published in 2013 by Woolshed Press, an imprint of Random House Australia.